The Tower of Babel, by Pieter Brueghel the Elder. Public domain. God’s confusion of mankind’s previously unified language at Babel (Genesis 11:1-9) is regularly criticized by skeptics. Wikipedia articles, for example, repeatedly refer to this account as an etiological myth that purports to explain the origin of differing languages. Now the whole earth used the same language and the same words. It came about as they journeyed east, that they found a plain in the land of Shinar and settled there. They said to one another, “Come, let us make bricks and burn them thoroughly.” And they used brick for stone, and they used tar for mortar. They said, “Come, let us build for ourselves a city, and a tower whose top will reach into heaven, and let us make for ourselves a name, otherwise we will be scattered abroad over the face of the whole earth.” The Lord came down to see the city and the tower which the sons of men had built. The Lord said, “Behold, they are one people, and they all have the same language. And this is what they began to do, and now nothing which they purpose to do will be impossible for them. Come, let Us go down and there confuse their language, so that they will not understand one another’s [g]speech.” So the Lord scattered them abroad from there over the face of the whole earth; and they stopped building the city. Therefore its name was called Babel, because there the Lord confused the language of the whole earth; and from there the Lord scattered them abroad over the face of the whole earth. The most challenging aspect of the biblical account is the undeniable fact that the gradual development of various languages can be traced by linguists through history. Even some Evangelical scholars note this fact in their rejection of this account as literal history. The fact of gradual language development is not at odds with this biblical account, however. Genesis 11 does not claim that all languages now in use were born at the time of the “confusion.” Linguists recognize that the languages used today have all developed from a smaller number of more basic language groups or families (less than 100), and some linguists have suggested (though not proven) that these families developed from a single, proto-language. 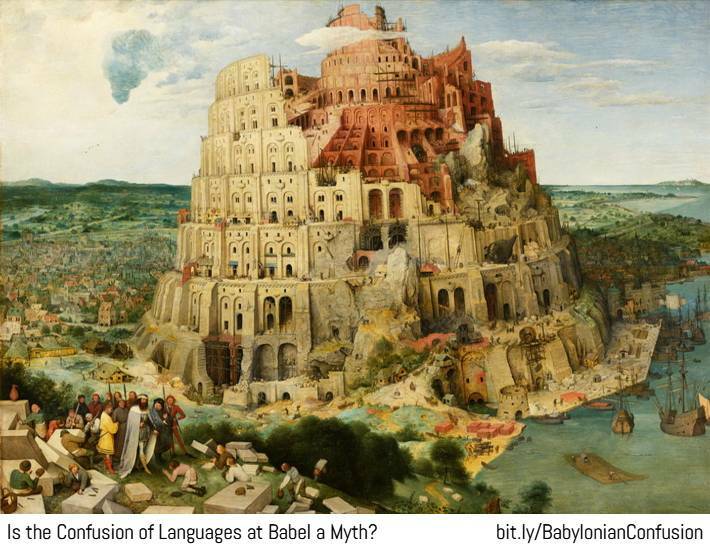 At Babel, God confused the proto-language into some number of linguistic families — families that eventually gave birth to a large number of independent languages. Languages change radically over time and the geographical separation of language communities exacerbates their inability to understand other communities as their languages change while the centuries pass. To see just how languages change, try reading this Old English (Anglo-Saxon) version of the Lord’s prayer. There is nothing in history or linguistics that genuinely contradicts the account of the confusion of languages given in Genesis 11 and unbelieving presuppositions are all that cause people to consider the passage mythological. Believers should have no qualms about describing Genesis 11:1-9 as accurate history. © Copyright 2018, David Kowalski. All rights reserved. Links to this post are encouraged. Do not repost or republish without permission.